Hello and welcome to September's The Book Club Cook Book Cooking Crew! 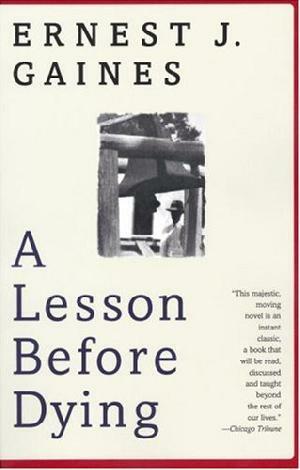 It is my month to host, and for this month I've chosen Ernest J.Gaines' A Lesson Before Dying. Before I even received The Book Club Cook Book, I had my heart set on making Minny's Caramel Cake from The Help because I’ve been looking for an excuse to try my hand at a homemade caramel cake ever since I read the book. When I saw Ernest J. Gaines' A Lesson Before Dying, however, I knew I had to do something to honor him and this book. Ernest J. Gaines is one of my all-time favorite authors and A Lesson Before Dying was actually the first book of his that I read about 15 year ago while I was in high school. I had a great English teacher who encouraged her students to read current literature while we were studying Nathaniel Hawthorne and Ambrose Bierce. Some of my favorite authors she introduced me to included Ernest J. Gaines, Billie Lets, and John Steinbeck. After her class, I consumed all the novels by Ernest J. Gaines that I could get my hands on. Gaines’ novels were the first time that I ever experienced a strong emotional reaction to something I’ve read. I’ve always grown up reading, but much of what I read was The Babysitters Club, Nancy Drew, and R.L. Stine. So his topics were eye opening and sometimes soul aching. But the emotions he invoked helped me to realize that there was so much literature out there besides simple and fun reads and the literature you’re required to read in school. This novel, like all of Gaines' novels, takes place in Louisiana and many of his novels have undertones of discrimination and prejudice that Gaines' experienced while growing up. His novels have a strong sense of community which help to create a resilience among the community and the characters is his novels, but the suffering and the loss are still there which all inherently affect the community. This particular book is about Jefferson, a man on death row, who is called a “hog” during his trial. Because of these names and how he is treated, Jefferson doesn’t see himself worthy of anything because he believes that he’s not a man. Jefferson’s grandmother brings in the town’s teacher to talk to Jefferson about what it is to be a man and to help him realize that he’s a man so that he can die with dignity. Food plays an important part in this book. Jefferson refuses food as well as any other kindness and gifts because he does not feel worthy of them. His grandmother sends over pralines, fried chicken, and other food to him but Jefferson refuses everything. When Jefferson finally accepts food, this signifies his acceptance of being a man or realization that he is a man. It is appropriate to choose this book as it is also the 10 year anniversary of Hurricane Katrina in which Louisiana was one of the southern states affected where over 1000 people lost their lives. If you’d like another taste of Gaines’ work, you can read about his reflections on Hurricane Katrina at National Geographic which he also depicts this sense rebuilding and community, but the loss and change that will continue to linger on. So for this book, as you can see, I decided to share with you a recipe that includes pralines which is a significant part of the book. Pralines are one of my guilty pleasures! I absolutely love the buttery, nutty, and brown sugary combination. Pralines are something that I just cannot pass up. This Chocolate Cake with Praline Topping is one of my favorite recipes that I’ve been making for the past 6 years since it was featured in Bon Appetit magazine, and I’ve been waiting for the perfect time to share it with my readers. It takes a little bit more time to make, but it is definitely worth it for all those that have a sweet tooth! 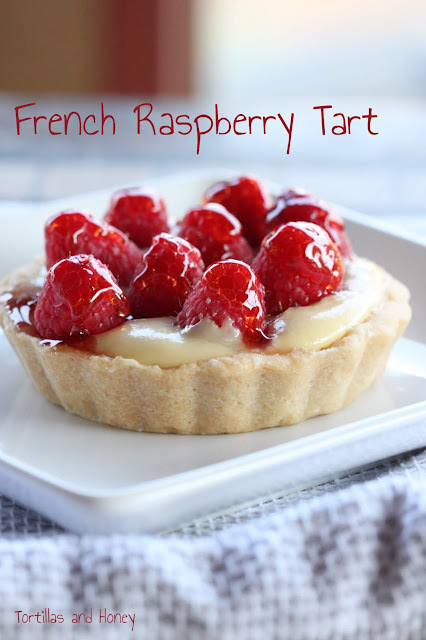 This is a perfect recipe to make and enjoy with a nice cup of coffee. Another great thing about the recipe is that it includes a recipe for pralines! Just follow the directions for praline and scoop out onto parchment paper or aluminum foil into your desired size, then let sit to firm up for about an hour! One tip I have if you do this is toss in more pecans to get your desired texture—less pecans, the more flat and spread out the pralines will be; more pecans, the more rounded they will turn out. It’s really your preference. For me, toasted pecans truly make a difference in taste so I also suggest making sure that you use toasted pecans! I hope that you enjoy my pick for the month and that you’re inspired to make some great recipes! Don't forget to come back on September 30th to see all of the wonderful recipes that others are contributing! Please check out below for a great giveaway—enter to receive a copy of The Book Club Cook Book!!! Check out these other awesome bloggers who are participating in The Book Club Cook Book Cooking Crew, and check back later to see what recipes the bloggers were inspired to make! Follow this project on social media with the hashtag #thebookclubcookbookCC. We'll be posting all of our creations to our Pinterest board. Here's the team, in alphabetical order with links to their homepages. 3. Include a link back to the hosting blog (that's me!) – Tortillas and Honey - somewhere in your post. 5. Your post must be current (during September 2015). And, of course, we don't mind if your post is linked to other events. The more, the merrier. Deadline for submission is: Monday, September 27th and the roundup of recipes will be revealed on this blog on Wednesday, September 30th! This month I am hosting the cookbook crew as well as giving away a copy of The Book Club Cookbook. * Enter to win a copy of the cookbook so you can join us in future months, if you wish! One of our lucky readers - US and Canada only! - can enter to win a copy of The Book Club Cookbook, Revised Edition: Recipes and Food for Thought from Your Book Club's Favorite Books and Authors by Judy Gelman and Vicki Levy Krupp, courtesy of Tarcher-Penguin. Giveaway runs from September 1st till September 30th at 6 o'clock PM, Pacific time. Please see terms and conditions in the rafflecopter widget below. Many thanks to Tarcher Books. You may find Tarcher: on the web, on Facebook, on Twitter, and on Pinterest. *Disclosure: I received a complimentary copy of The Book Club Cookbook, Revised Edition: Recipes and Food for Thought from Your Book Club's Favorite Books and Authors by Judy Gelman and Vicki Levy Krupp to use in this year-long project plus the opportunity to give a copy away. Opinions are our own. We received no further compensation for our posts. Place butter and cocoa powder in medium bowl. Pour 1/2 cup boiling water over; stir. Let stand 2 minutes; whisk until blended. Whisk flour, sugar, baking soda, and coarse salt in another medium bowl. Whisk buttermilk, egg, and vanilla in large bowl. Gradually whisk cocoa mixture into buttermilk mixture; whisk until smooth. Add flour mixture in 3 additions, whisking to blend between additions (batter will be thin). Pour batter into prepared pan. Place chocolate and cream in microwave-safe bowl. Heat in microwave in 15-second intervals, stirring occasionally, until melted and smooth. Stir in butter. Let stand until spreadable, about 30 minutes. Spread over top and sides of cake. Transfer cake to plate. Chill 2 hours and up to 1 day. Stir first 3 ingredients in heavy large saucepan over medium-high heat until butter melts. Boil 1 minute without stirring. Remove from heat; whisk in sugar and vanilla. Add pecans; stir just to incorporate. Quickly pour praline over cake. Spread just to edges (topping sets quickly). 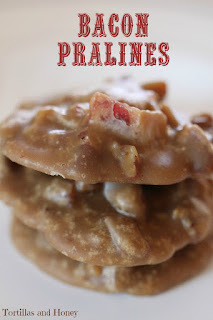 NOTE: You can use the praline ingredients and directions to make traditional pralines! Just follow the directions to make the mixture, then scoop out onto parchment paper to make your desired size. 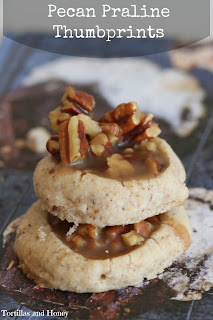 You can also add in more pecans if you like pralines to be more round. Less pecans equal flatter pralines; more pecans equal more round! him. I picked up this book thinking I would have a couple of weeks to read it and then submit my recipe. I read it in two days. I know what I am going to make and will be sending you that info in the next week or so. Thanks for hosting this month and for choosing this novel. 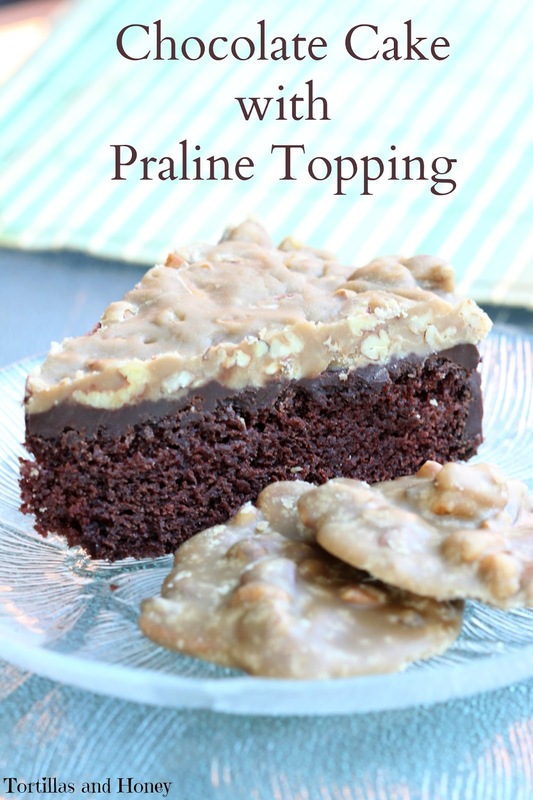 I love praline and topping the cake with it was genius! This cake looks dangerous!!! Books and Food is a great combination! I would love to win this cookbook.